In 1800 the Act of Union was passed to formally join Ireland with England, Wales and Scotland in the United Kingdom. Prior to this, Ireland had been governed by its own parliament in the Irish House of Commons in Dublin (now the headquarters of Bank of Ireland), but had maintained a personal union with the UK and recognised the British monarchy as that of Ireland as well. Union resulted in Irish representation moving to the Houses of Parliament in Westminster, taking administration of the island away from Dublin. 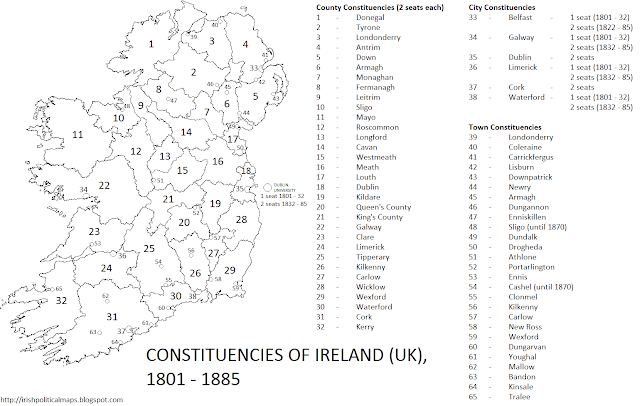 The constituencies which had served the Irish parliament were mostly kept on within the UK - the only major change being the disenfranchisement of several borough constituencies such as Askeaton, Jamestown and Midleton. All thirty-two counties returned two members each, while the remaining borough constituencies returned one. In 1832 this was amended so that the larger cities of Belfast, Cork, Dublin, Galway, Limerick and Waterford (as well as Dublin University) each held two seats. Throughout the lifetime of these boundaries only one other change was effected - the disenfranchisement of Cashel and Sligo Borough in 1870 over problems caused by corruption at the polls. In 1885 the Irish constituencies were radically overhauled to match the single-seat system in place throughout Great Britain. Having remained in use with only cosmetic alterations for 84 years, these electoral boundaries have been some of the longest-lasting in Irish electoral history, serving 21 general elections. Please note that the city and borough constituencies on the map are not to scale, but are shown as they are for ease of presentation.